Currently I’ve been trying to understand more about the dynamics of markets and basic concepts of microeconomic theory and, as always, writing a blog post will help me to keep my ideas clear. First, why are markets interesting from a computer scientist/mathematician point of view? Markets are multi-objective optimization problems: one can think of the possible state of a market some point in a space of possible . Each player of the market controls one variable, say and is interested in maximizing one objective function . So, player is trying to set . Markets are a computational model: one can think of a market as a way of performing a certain computation – as extracting some kind of information, as a prediction market, stock exchanges, … If we think of it as a computational device, we are asking the same questions: given those preferences which are implicit functions to each of the agents, calculate “fair” prices of items. Markets are distributed systems where each part of the system has a selfish interest. Each consumer is defined by a set of commodities combinations he is interested (typically we take ) and an utility function expressing his interest for this bundle of commodities. Consumer will try to maximize in a further restricted . Each producer is define by a set it has the capacity to produce. Endowments: Each consumer comes to the market with an initial endowment , so for , is the amount of commodity that consumer originally has. The initial total endowment of the market is given by , which is a vector indicating how much of each commodity originally exists in the market. Shares: consumers have shares in the companies, so for , , consumer has shares of company , such that . by producing , company gets profit , so each company will try to maximize its profit producing . each consumer sells its initial endowment and gets the profit respective to the companies he owns. So, consumer gets . now consumer uses the money he has to buy the best bundle he can afford, which is . First, it is not clear if such a price vector exists. If it exists, is it unique? If this is an equilibrium, is it the best thing for the consumers? How those prices can be set in practice without a centralized authority? Can people lie? Below, let’s collect a couple of questions I’ll try to answer (yes, no or unknown) in this and the following posts. Question 1: Does a price vector always exist that generates an equilibrium? Question 2: If it exists, is it unique? Question 3: Can we describe an efficent method to find ? Question 5: A central authority could use the knowledge about functions and endowments to calculate the price vector using some method. Can consumers be better off by lieing about their utility and endowments? Question 6: How prices get defined without a central authority? Is there a dynamic/game-theoretical model to that? Definition 1 An exchange economy is composed by a set of commodities and a set of consumers each with an utility and an initial endowment . The first condition says that each consumer is maximizing his utility given his prices, the second says that we can’t buy more commodities than what is available in the market and the third, called Walras’ Law, says that if there is surplus of a certain product, it should have price zero. It is by far the most unnatural of those, but it can be easily justifiable in some circumnstances: suppose we say that utilities are non-satiated if for each and , there is , such that . If are differentiable, that would mean , for example a linear function with some . In that case, and some player has money surplus and therefore he could increase his utility. Theorem 3 Given non-satiated preferences, each equilibrium is Pareto, i.e. there is no other feasible allocation such that for all , with the inequality strict for at least one component. Proof: Suppose there were, since then , because if then we could improve the utility of still within the budget, contradicting the optimality of for that budget. And clearly implies . Summing over , we get , what is a contradiction, because since is feasible, and therefore . Now, let’s tackle Question 1. We assume linearly of utility: for . This gives us strong monotonicity and local nonsatiated preferences. Theorem 4 Under linear utilities, there is always an equilibrium price vector . Definition 5 A correspondence is said to be upper hemicontinuous at the point if for any open neighbourhood of there exists a neighbourhood of a such that is a subset of for all in . Walras’ Law: . For any we know by the definition of . So, if it not zero, some has money surplus what is absurd given that preferences are strongly monotone. Boundary behavior: if with , then . That is clear from the fractional knapsack algorithm when one desirable item gets price zero. Theorem 6 (Kakutani, 1941) If is an upper hemicontinuous correspondence such that is a convex non-empty set for all then has a fixed point, i.e., s.t. . Since prices are -homogeneous, consider the simplex , its relative interior and the boundary . Now we define the following price correcting correspondence . Now, I claim that this correspondence satisfies the conditions in Kakutani’s Theorem. We skip a formal proof of this fact, but this is intuitive for the interior – let’s give the intuition why this is true as we approach the boundary: if , then , therefore the demans explodes: and as a result the best thing to do is to set the prices of those commodities much higher than the rest. Therefore, the price of the commodities whose demand explode are positive while the prices of the commodities where the price doesn’t get value zero. Now, after waiving our hands about the upper continuity of , we have by Kakutani’s Theorem a point such that . By the definition of we must have (because for , . Now, I claim . In fact if , still by Walras’ Law. So, if then there is with and therefore for all , and . For this reason . A king promised to marry his daughter to the most intelligent man. Three princes came to claim her hand and he tryed the following logic experiment with them: The princes are gathered into a room and seated in a line, one behind the other, and are shown 2 black hats and 3 white hats. They are blindfolded, and 1 hat is placed on each of their heads, with the remaining hats hidden in a different room. The first one to deduce his hat color will marry the princess. If some prince claims his hat color incorrectly he dies. The prince who is seated behind removes his blindfold, sees the two hats in front of him and says nothing. Then the prince in the middle removes his blindfold after that and he can see the hat of the prince in front of him. He also says nothing. Noticing the other princes said nothing, the prince seated in the first whole, without even removing his blindfold, gives the correct answer? The question is: what is the color he said? There is one prisoner and there are two doors: each has one guardian. One door leads to an exit and one door leads to death. The prisioner can choose one door to open. One guardian speaks only the truth and one guardian always lies. But you don’t know which door is which, which guardian is which and who guards each door. You are allowed to choose one guardian and make him one Yes/No question, and then you need to choose a door. What is the right question to ask? There are black and white hats and people: for each of them we choose one color independently at random with probability . Now, they can look at each others hats but not at their own hat. Then they need to write in a piece of paper either “PASS” or one color. If all pass or if someone has a wrong color, the whole team loses (this is a team game) and if at lest one person gets the color right and no one gets wrong, the whole team wins. Create a strategy for the team to win with probability. which can be or . The strategy is: if either one of those vector is in , write the color corresponding to the other vector. If both are out of , pass. The team wins iff , what happens with probability. Is is an easy and fun exercise to prove those facts. Or you can refer to the solution I just wrote. Color guessing problem: There are people wearing hats of different colors. If each person can see everyone else’s hats but not his or her own. Each person needs to guess the color of his own hat. We want a deterministic guessing algorithm that fraction of each color class is guessed correctly. Let be an array of colors the array with color removed. 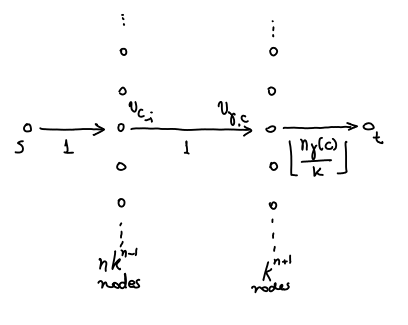 Consider the following flow network: nodes and (source and sink), nodes for each . There are such nodes. Consider also nodes in the form where is a color ( ) and is a color vector. There are such nodes. We have edges from to for all nodes of that kind. And we have edges from to . Now, if , i.e., if completed in the -th coordinate with generates , then add an edge from to . Consider the following flow: add unit of flow from to and from split that flow in pieces of size and send each to for . 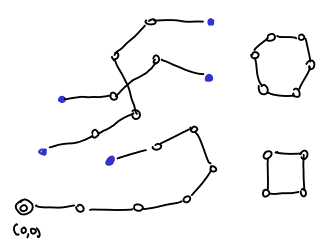 Now, each node receives flow, where is the number of occurencies of in . Send all that flow to . We can think of that flow as the guessing procedure. When we see we choose the guess independently at random and this way, each receives in expectation guesses . Notice that an integral flow in that graph represents a deterministic guessing procedure: so all we need is an integral flow so that the flow from to is . The flow received is from nodes of the type: and that means that bidder in , looking at the other hats will correctly choose , times. Now, define the capacities this way: for all edges from to and from to have capacity and from to capacity . There is an integral flow that saturates all edges from to , because of the fractional flow showed. So, the solution gives us a deterministic decision procedure. In the next blog post, I’ll try to show the result in the Derandomization of Auctions that relates that to competitive auctions.